Ms. Falcon at the 2016 Housing For All Rally. We are extremely pleased to announce that Ms. Elizabeth Falcon will be the next Executive Director of DC Jobs with Justice. For over a decade, Ms. Falcon has been a passionate advocate for social change in Washington, DC and across the Deep South, with a proven track record of running effective campaigns and maintaining strong coalitions. She is an experienced coalition leader who believes in the power of bringing people and organizations together. Throughout her career, she has led community partners to build consensus on strategic direction, developing effective campaigns such as the Housing For All Campaign and Save Our Safety Net. 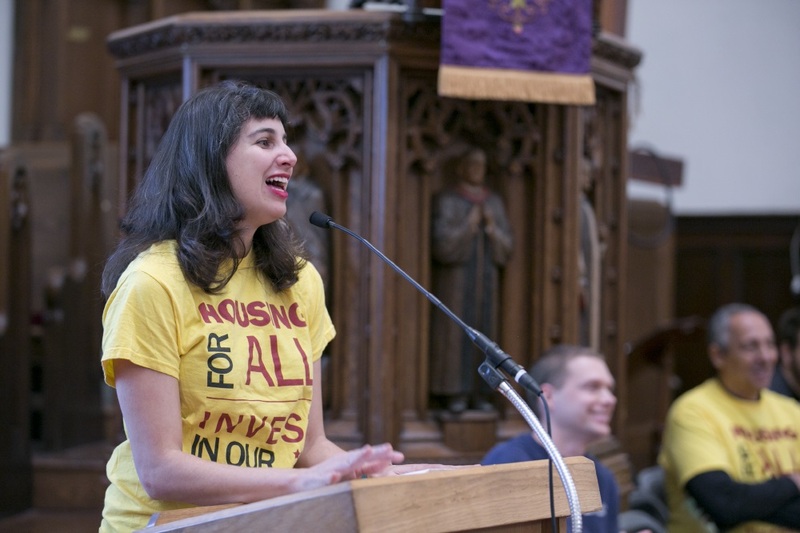 Under her leadership at Coalition for Non-Profit Housing and Economic Development (CNHED), the Housing for All campaign became a well-recognized force, with over 4,000 individual supporters and hundreds of participating organizations, winning over $300 million in affordable housing investments. As a result, she is a trusted partner with advocates, labor, and diverse communities across the District. We are thrilled to have Ms.Falcon join our team as the Executive Director. Her campaign planning skills, strong local relationships, and dedication to developing affected DC residents to lead campaigns will be critical as our organization moves into the future. Ms. Falcon officially starts at DC JWJ on August 15, 2016. Our current Executive Director, Nikki Lewis, will step down on August 31, 2016.